3 in 1 Lens Kit: 3 detachable mini lenses add-on for your smartphones and tablets, enhance your camera capability and create amazing photos. 180 Degree Fisheye Lens for wide hemispherical image without dark corners , 10 X Marco Lens for taking extreme close-up pictures within 1 inches, Wide Angle Lens gives you a larger image circle. High Quality: Professional optical coating lens, made of upgraded HD glass, reduces glare and reflection. 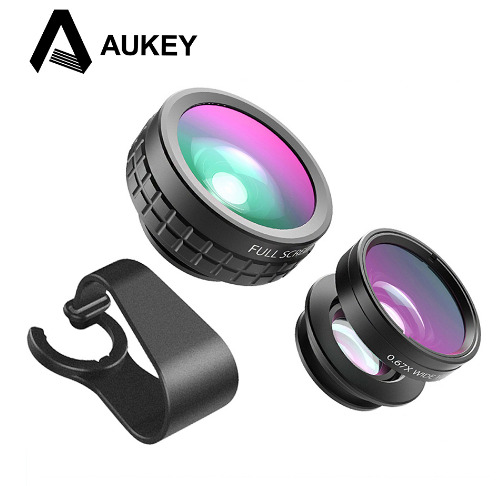 Take better photography and capture the instant beauty on your mobile phone with the Aukey 3 in 1 Cell Phone Lens Kit. Made with professional grade HD glasses, the lens does not alter the phone camera characteristics.